If Porky’s movie and Scooby-Doo cartoon had a baby it would be the new “Baywatch” movie. Be one with the ocean and the ocean will reveal secrets that may greatly impact your life. Crazy talk? Or, maybe just the type of talk to spew out of your subconscious after being attacked by a poisonous sea urchin. 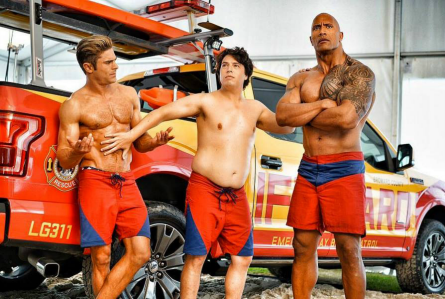 Just one example of the wacky and campy scenarios laced throughout the new “Baywatch” movie. In the case of head Baywatch lifeguard, Mitch Buchannon (Dwayne Johnson), there’s a bit of truth in this as well. Proven to be the ultimate lifeguard which is showcased in the opening scene when Mitch anticipates a tragic situation before it even happens and emerges from beneath the ocean, with arms cradling a male rescue as the words BAYWATCH in block letters erupt through the water behind Mitch. 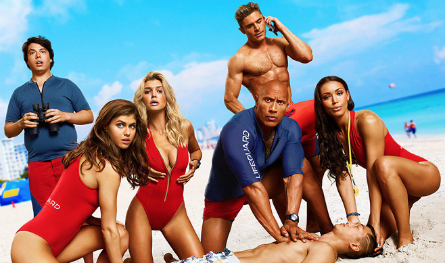 This set the tone for the semi-slapstick, semi-campy “Baywatch” revival of the TV show perfectly. Set in Miami beach, Scooby-Dooisc crime solving has never been sexier. The amateur detective, but all pro lifeguard is played by the perfectly chiseled Dwayne Johnson who leads the cast of life-guard characters. This includes his right-hand woman Stephanie (Ilfenesh Hadera), and blonde bombshell C.J. Parker (originally portrayed by Pamela Anderson, now portrayed by Kelly Rohrbach), along with fresh meat recruits Summer Quinn (Alexandra Daddario, originally played by Nicole Eggert), the a lot less chiseled Ronnie (Jon Bass) who Mitch uses as a distraction in his big plan to take-down a drug dealer disguised as a club owner, and a hot-head ex-Olympian star Matt Brody (Zac Efron, originally portrayed by David Charvet). When a fatality from a boat fire happens in his beach, Mitch attempts to save his reputation by digging a little bit deeper to solve this mysterious incident, along with the sudden findings of Flakka drugs on his shorelines. All arrows point to a newly implanted wealthy real estate tycoon and club owner Victoria Leeds (Priyanka Chopra) who seemingly has a thing for Mitch (but, not really). A seemingly lost cause to contribute as a team-player, Brody fights Mitch every step of the way until the world of Mitch is suddenly placed upon his shoulders. How he handles this is a surprising turn-around which ends in a collaboration to take-down the antagonists of their serene Baywatch. Raunchy comedy is back. 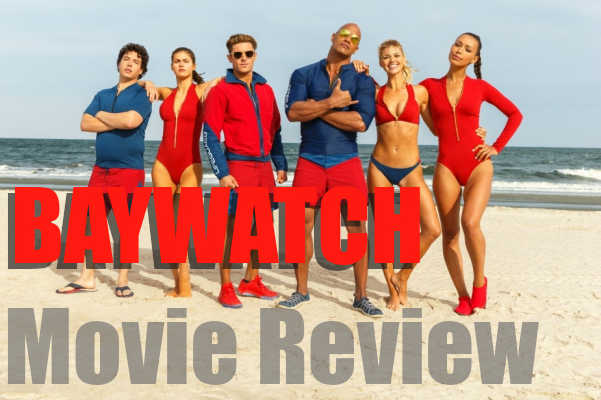 “Baywatch” is reminiscent of a sexual comedy genre popular in the early 80’s with films such as “The Last American Virgin”, “Fast Times at Ridgemont High”, and “Porky’s”. The style became popular again in the late 90’s with movies such as “American Pie”, and “Something About Mary”. In fact, if “Porky’s” movie and Scooby-Doo cartoon had a baby it would be the new “Baywatch” movie. It’s a fun and sexually explicit film (though more for the female audience than for the male audience). One particular scene in “Baywatch” involving a man’s junk, is very similar to a famous boys’ locker room scene in the “Porky’s” movie. Viewers old enough to remember that will know exactly what that is. Everyone else, look it up! The amateur ways that the lifeguard crew goes about putting their puzzle together of stalking the bad guys is very much like the characters from Scooby-Doo. The caught criminals would have definitely gotten away if it had not been for those “pesky” lifeguards meddling! The “Baywatch” film has a cartoonish feel when things magically pop-up out of nowhere with no explanations (this very well seems more like an editing choice, as we saw in the post credits bloopers). For example, HOW did Mitch and Matt Brody suddenly not only get into their disguises in a scene, but also where did they find them? Beware of flying body parts in an explosive third act! 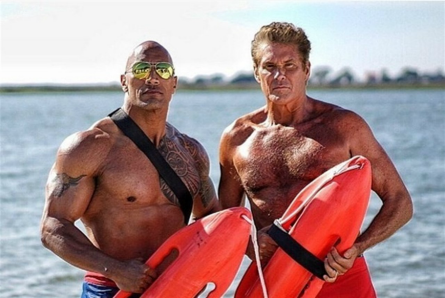 One disappointing kink in “Baywatch” is everyone seems to be getting love action, Ronnie included, except for Mitch. I would have liked to have seen a love interest added into the movie for him. This might be something festering for a possible follow-up sequel (we hope!). Audiences will also be pleasantly surprised by two former Baywatch stars who return as different characters – David Hasselhoff (the original Mitch) and Pamela Anderson, the original CJ Parker, but is now playing “Casey Jean Parker”, likely either the mother or aunt of the new CJ. This red flag is an indication of a follow-up “Baywatch” film that is pretty obvious to happen. Directed by Seth Gordon, “Baywatch” brings the heat of summer via movie theaters on Thursday, May 25, 2017.